I offer my obeisance unto my lord, Srila Bhakti Raksak Sridhar Dev-Goswami Maharaj, whose speech is most pleasing; whose divine form is adorned with garments the colour of the newly-risen sun; who is an abode of intense, ecstatic devotion; who is the sadhus' sole choice; who is an ocean of renunciation and knowledge; who is a treasure-house of perfect conclusions; who is resplendent with pure devotion; who is the best of Srila Saraswati Thakur's followers; who is the giver of all good; who is the leading general of the tridandi-sannyasis; and who is my sole shelter. I am always worshipping with great joy within my heart Srila Bhakti Raksak Sridhar Dev-Goswami Maharaj, whose limbs are of the radiant golden colour and form is beautiful and moon-like gentle; Sri Guru who excels among the most learned and who is filled with all perfections; who is adorned by the garments the colour of the rising sun and who is engaged in the joyful Pastimes of bestowing bhakti, devotion. Presented here is an autobiography of His Divine Grace Srila Bhakti Raksak Sridhar Dev-Goswami Maharaj, the Founder-Acharya of Sri Chaitanya Saraswat Math. I was born at midnight, Saturday 10th October, 1895. Navami tithi under the same sign as Lord Ramchandra. Krishna-paksa (dark moon fortnight). Sriman Mahaprabhu was also born on a Saturday. I was the second child. The first was a daughter, but she died early, so Ram kavach was given to my mother for the protection of the next child, that is, myself. So I was born after my mother took Ram kavach. There were two thatched rooms, one of which was the maternity room. Because the first child had been lost, after I was born and my mother was still confined within the maternity area, just in the front of that place my two English-knowing cousins kept night watch to make sure that no ghosts or something like that may come in the shape of a cat, or in any other way. So as they were reading and studying, they would protect the first half of the night. They were B.A.s studying for M.A. And during the second half or last portion of the night two Sanskrit students, one cousin and another, an uncle, sat there just in front of that temporary shed, reading, to guard against any unseen attack at that time. They all kept night watch. Then, as I remember, when I was a boy being carried on the shoulder of my father, there was one Sankirtan party going in the distance; crying, I asked him to take me there. Anyway, to console me he took me there for some time and then came back. Then, my first brother was born when I was three. I remember the scene of the birth of my brother, around August, 1898. I can also remember when I reached the age of five and I was engaged in studying writing, and I was given to my maternal uncle's house. Many things before that I can remember as well. And when I was in my maternal uncle's house, for three years for early education in a primary school, I got some help from one of my aunts who taught me Ramayana and Mahabharata. That helped me a great deal. Already I had some affinity for all those things, some type of intuitive knowledge and partiality to ancient mythological teachings and culture of the orthodox section. From very childhood my tendency was with the culture of the orthodox section—Veda, Upanisad, etc., faith in God—all these things. At nine years old I was admitted into a high school [intermediate according to the current system in India]. As a student, I always sided with the ancient Sastric culture in the debating club there, even against the teachers that took up the cause of the renaissance or reformation. I was always on the side of the previous culture. I fought against them, and I don't think they could defeat me. Then I got my sacred thread in the family tradition when I was fourteen years. I feel that my memory was more or less quite sharp. I could remember what I saw and heard in my early age. I am told that I had a general tendency that if anyone would come to ask me something, I would reply, "No." Whatever would be asked of me—"No." But once, when one of our family-members, a scholar, went to take his examination, he came to ask me whether he would pass or not. I pronounced, "Yes." And he won a scholarship. Then I matriculated from the local high school when I was fifteen years of age. I could write Sanskrit verse before that. I like sacrifice in life. The magnanimous side. I had affinity for Lord Ramchandra, for the model Pastimes, but not so much Lord Krishna because of His Vrindavan Lila. I could not accommodate why God should be a liar and a girl-hunter, though I saw Radha-Govinda Murtis—They seemed to be very, very charming. I found some mystic background there, but on the surface, I had more liking for Ramchandra than Krishna. My attraction to Krishna first came through Bhagavad-gita, and then through Mahaprabhu. I liked Ramchandra for His magnanimity. I was mainly attracted by the self-giving ideal, so I liked Radharani very much, I liked Mahaprabhu very much, but my attraction to Krishna was less. My attraction to Krishna came through Mahaprabhu and through Radharani—from Their side. When I was nine or ten or so, there was a temple where Radha-Krishna Deities were installed in Jagadananda Pur, near Katwa. Every year in Kartik month my father used to read Srimad Bhagavatam there. Sometimes I visited that temple with him, and I found some mystic atmosphere there. It seemed very mystical to me. After matriculation, I went to Baharampur [District Mushirabad] for college study at the Krishnanath College. There, with the company of one of my cousins (my maternal uncle's son), I came into connection with the East Bengal people, who were renowned, we had heard, for their boldness and sacrificing nature. I took residence in the same hostel as them and was admitted in that same college at Baharampur. After the fourth year we sat for the examination of B.A. When I was a student of the fourth year I came into the connection of a younger boy who had just passed matriculation and was newly admitted into the college. In the college I found that there was a small section of students who were addicted to some meditation and puja, etc., and there was another group that did not care for worshipping, but they liked the service of patients and to do good for the public. But I have an internal nature for both. I was a fourth-year student and that boy was a first-year student—three years gap. I found that he was given to both sides very intensely; taking the Name of the Lord sometimes very loudly like a madman, and also doing sandhya-vandana [regular morning, noon and evening prayers and worship], etc. At the same time, when there was any patient he would engage himself in their service, even neglecting to attend the college class. Both sides—social service as well as worship were combined in him. Before this, when I studied at school I got a book where it is mentioned that if we can go on with the japam [meditational chanting] of Gayatri 432 times daily, we can achieve a very good spiritual improvement. I practised that for some time, and at that time I tried my best to understand the revealed truth—without consulting any dictionary or grammar; I had heard that Gayatri is conscious, spiritual, not dead words, so, I thought, "If I go on with japam, Gayatri itself will express its meaning and purpose." I approached it with that attitude, and I used to feel some light coming from the words of Gayatri itself; I had some knowledge about that for some time. Then, as I said, I came in connection with that boy in college, and I tried to associate with him. His name was Sri Suresh Bhattacharya—he came from a brahman family of Faridpur. The founder of the Bharat Seva Ashram, Sri Pranavananda, was from his village. Sripad Madhusudan Maharaj also comes from the same village—Bajepratap Pur in the district of Faridpur. One day, when we two were going on a morning walk and also cleaning our teeth with small twigs, he referred to his father with the expression, 'that gentleman.' I took exception to that. "Why do you use this expression for your father? You say 'that gentleman'? What is this!" He said, "Yes, I have committed a wrong; I shouldn't have spoken in this way before you. But really it is like that. 'That gentleman'—he was a gentleman, and in this life I came to him, he has protected me for some time, and in the next life I shall go to some other place; in this way we are moving hither and thither, coming to some gentleman and from there to another gentleman..."
Although I gave opposition, that point hit me very hard. I began to think, "Yes, it is true. We are in the midst of father, mother, brother, or, as he said, 'that gentleman'. What real connection do I have with them, or they with me? We are all almost like strangers!" Thinking and thinking on this point, the whole world became as vacant. I felt a furious atmosphere, with no shelter to take anywhere—a chaotic position, and I have no position of stability. Wherefrom am I coming, where to go, how long am I to stay here? This is a point in the infinite. I am an uncertain point in the whole of the infinite. A great shock came to me in this way, and that was the great turn in my life. The worldly achievement has no value. I was studying, a fourth-year student. I was to appear in a few months for the final examination. My friends were alarmed at seeing my position. "What are you doing? You are neglecting your studies! How will you be able to pass? Your father is sending money [for your education]; you are not so rich." In this way they tried their best to help me but I couldn't concentrate on any book of study. They said, "If you can't do so, we shall read and you try to hear." At that time, my friend gave me some literature on Mahaprabhu's Life and Teachings, and I devoured it like nectar. I found some position there—it is not that I am nowhere. Here is the support—the basis, the foundation; I found here the sustenance, hope, and shelter I needed. In this way I began to read and read. My very nature was that whatever I read, I read scrutinisingly: it may be slow, but my reading is more or less very accurate and representing the true aspect. I could also hear very clearly. Even without reading, acute hearing was also a part of my nature. Whatever I heard, I could grasp the very purpose and keep it within me. And here also by thorough reading I found my life, my future hope, everything. I was converted. In my mother's family there was some recognition of Sri Chaitanyadev, but my paternal family were orthodox smartas. They hated the followers of Chaitanyadev. "Chaitanyadev has created a chaotic society—pests that cannot keep their own stand in the social position, it is they who gather to follow Chaitanyadev. Those who have lost their social position become Vaisnavas and they say that they are followers of Chaitanya." In my father's family they held such hatred. But after this I became fully converted into a follower of Chaitanya. Such a feeling came to me, not only intellectually, but in heart and mind also. I underwent a wholesale conversion. Then my father died. He was disappointed and dejected. I was the eldest son; he had some hope in me for family matters, but when he saw such a change in me, it may be said that he died almost heartbroken. The burden of the family also came on my mind, but my state of mind was somewhere else. The chance came to me to lead a life of abnegation. For one year the son [of a departed father] won't use any umbrella or shoes; I made some extreme addition—I used nothing but one piece of cloth and a sheet for one year. And half-mad I used to do agriculture work and service to the cows. Anyway, I passed the B.A. The Baharampur section where I appeared, my classmates, said this was a wholesale massacre! Very few could pass, but somehow I passed. Some of my classmates said, "Oh, by the method of worshipping and satisfying God he has passed! He did not study at all but he passed, only by worshipping God." They said like this. I wanted to become a sannyasi, but the countrymen wanted one year, so I thought I must sacrifice this for them. I left the law college and worked for some time posted as a secretary of the movement here in Kalna, and sometimes in the village for two or three years. Then it was stopped for some time, and later I was wanted for service in Kolkata. With the help of a government office superintendent I got some vocation, and I put up in Kolkata. I attended the office there. My attraction stays always towards Mahaprabhu. In the meantime, I wandered here and there searching for a sadhu from whom to take initiation. But I couldn't select anyone to my taste or satisfaction. One day, I was returning from the office and I found a placard in Chitaranjan Avenue: Gaudiya Math Mahotsav for one month. The address was given, near the Pareshnath Temple. I found this red-coloured placard. I thought, "Gaudiya Math must be Mahaprabhu's followers, let us go and see what is there." When I was a law student, through Suresh Bhattacharya I knew the founder of Bharat Seva Ashram, Sri Pranavananda, and he tried his best to take me into his mission; but I flatly refused. "My head is sold to Mahaprabhu, Gauranga, so I can't go anywhere else." He said, "I also have great reverence for Mahaprabhu Chaitanyadev, but I think the first stage must be Buddhistic abnegation or vairagya and indifference [to the world]. Second, Sankar's Vedanta or jnana. And the last and highest will be Chaitanya's Prema. Otherwise people will misunderstand that Prema for lust." I replied, "Yes, what you say is alright—that Sri Chaitanyadev's Prema-dharma is the highest, above the Buddhistic and Sankarite conceptions of theism. But Chaitanyadev has not told us, 'Go to the Buddhists, practise vairagya, then go to Sankar and have knowledge of the Vedanta, and then come to Me.' He has told, 'Wherever you are, take the association of a sadhu and you can take the Name.'" I said to him, "If you have got any supernatural power, I will be grateful if you can say where my spiritual guide, my Gurudev, is." But he took the name of some gentleman, Haranath. I went to search for him but could not find him. But this was when I found that placard and went to Gaudiya Math. There I found only one gentleman manning the outside hall, and the rest had all gone on procession of nagar-sankirtan. Then I had a little talk with that gentleman. I had studied somewhat about Chaitanyadev and other Scriptures, but I found that these people representing the Math had deeper and more sound knowledge than I. Then, the party came back from Nagar-sankirtan and I found Guru Maharaj in front with his danda. As soon as he reached the front of the Math some disciple came and took the danda from him and gradually he was received there. At first sight I found Guru Maharaj's attitude was that of complete indifference to the ordinary world. He does not care for anyone, he is self-sufficient. I got that sort of impression from his first sight. Then I began visiting. Gradually I came to realize that I wanted to stay in such company. Unfortunately I had been unable to find it before, but now the thought came to me, what is to stop me coming and staying here? I cast my glance homeward—father gone, mother living, three younger brothers—they won't be much affected. But my wife will be affected. I don't know why, but a sudden thought came in my mind that if she dies, I am free. I was attracted by that association. There were so many members of gentlemanly and educated nature, and wholly given to the Service of Mahaprabhu. That attracted me most. And it was that very day: I came to my quarter and found that my wife was ill. I came home that night, and after three days she passed away. My mother tried to have me married again, but she could not do so. And within six months she also disappeared in Haridwar at the time of the Kumbha Mela. She died there. One of my brothers, Satyen, was attending her with other pilgrims and sisters, etc. I was free. I was visiting the Math. I was thinking that I must cast my faith here, so I thought it necessary to know as much as possible about the mission; and to know the mission means to know the leader of the mission. So I tried to go upstairs, where Guru Maharaj stayed. I would go in front of his room and sit there to hear, because I was thinking I shall join here. Then one day, it so occurred that Kirtanananda Prabhu, one brahmachari, stopped me when I was making an attempt to go upstairs. "I'm going to Guru Maharaj. I like it very much [to hear and associate]." "No, never. You must stay here in the waiting room, and when you find anyone you will inform him who you want to meet. He will check, and when he returns with the answer you can go. Otherwise you must stay here. Never cross this threshold." But at that very moment the position of Sukadev appeared in my mind. I had read in Mahabharata that Srila Vyasadev sent Srila Sukadev Goswami to Rajarsi Janak to finish his education, or sadhana. Srila Sukadev came, and he was detained for seven days at the outer gate. Then information went to Janak, who sanctioned, "Allow him to pass the gate." The next gate, he was again detained. In this way, there were seven boundaries of the capital, and at each of the seven gates he was detained for seven days. So seven times seven means he had been detained for forty-nine days, and only then he could meet Janak. This thought came in my mind. And then the next concluding thought came, 'If there is anything bad here, and they take me and put me onto a throne to worship me, I should not come here; and if there is real good, and they beat me with a broomstick, I must not leave!' That conclusion came in my mind, and I kept visiting. "য়ে কোন বক্তব্য ?—"Has he something to say?" The attending person came and asked me, "Have you something to say?" "No. I have nothing to say." He went back. "He says he has nothing to say." Then Guru Maharaj said, "He has something to ask?" He again came to me, and said, "Guru Maharaj said, have you got something to ask?" "No, I have nothing to ask." He again returned to Guru Maharaj. "He says he has nothing to ask." Then again Guru Maharaj put, "He has got some purpose in mind for coming here." The person returned to me. I said, "Yes, without purpose no incident can happen. When I have come, I have some purpose." "To gain the grace of you all." That was my answer. "আপনার প্রসন্নতা ।" Nothing else but that. "Yes, you are fortunate. You are born in the area of Gaura-mandal." They had one booklet printed then and the attending person said, "Guru Maharaj is offering this booklet to you." I said, "I already have it." He said, "That does not matter; with his good will he is giving this to you, so it is something else. You take it." Then I took it on my head and accepted it. That was the first talk with Guru Maharaj. The following year I was invited to Sriman Mahaprabhu's Appearance Ceremony at Mayapur. At that time I was visiting the Math and hearing. I went there for the Ceremony. At that time my mother was also inviting me to the village Gumo where she was staying with my second brother. She wanted to see me before going to Haridwar, and the Gaudiya Math people were also inviting me to Mayapur. I was in a dilemma. What to do? It was my mother's call—and maybe the last one. She might not live, her health was not good. This was the call. And I thought, I want to take this side in my life, so this side must be given preference. That is, I avoided the call of my mother to see her, and I went to the Gaudiya Math instead. From their talks in general, I found that they do not care for the opinion of anyone else; but when anything is quoted from Scripture, they give a patient hearing. This was their nature. Summarily they reject all, they don't care for anyone, but they care only for Scriptural truth; that they soberly consider and evaluate. But with abhorrence they reject so many stalwarts of the then society—this Aurobindo, this Gandhi, this Ramkrishna, the [imitationist] goswamis—they summarily reject them all. But Mahaprabhu, Bhagavatam, Gita—they are all-in-all. I had an attraction, a taste for them. I could identify with them. Then, when I went to Mayapur I again saw many things that touched me. Srila Prabhupad was delivering a lecture to so many gentlemen who had come from Krishna-nagar—educated persons. In another place the elderly Sripad Bhakti Pradip Tirtha Maharaj was giving a lecture. Somewhere else Sripad Bhakti Svarupa Parvat Maharaj was found writing receipts, collecting funds from the people. It was a hive of activity. I felt a transcendental, happy atmosphere there. When the celebration was over, Guru Maharaj was sitting in a canvas chair on the verandah of his room, and many persons were offering him obeisances and going home. At that time he was speaking, giving some discourse. I was always very eager to hear him. He was saying, "আপনারা আমাকে বঞ্চনা করিবেন না ।"—"Don't cheat me, you people." I was alert. What? Where was the question of cheating him? Why cheating?! Everyone was invited, they came, and now they are leaving; what was his point about 'cheating'? Then the next thing he said was, "You all came with the understanding that you will engage yourselves in the service of Krishna, and so I have entered into some relationship with you. And now, only as a fashion you have attended this ceremony and you are going home to engage yourselves in worldly affairs; but your assurance to me was that you would all serve Krishna, but... disappointed..." Then he continued, "You may say 'Oh, I have got some important business and after finishing this I shall come and join you as soon as possible' but no, no! If you tell me there is just a little fire and after extinguishing the fire you will return, then I say that is also not necessary. If fire burns the whole world you do not lose anything. Rather you are spared if you can disconnect from those things that are burnt. All your positive engagement, your inner hankering, has corresponding things in Krishna. All your necessities and hankering will be satisfied in the service of the holy lotus feet of Krishna, and nowhere else." He was speaking so forcefully. I was wonderstruck. I thought, "I would never hear anywhere in this living world such intense necessity for Krishna-bhajana—so I must throw my head here." It was then that I took the decision that I must be a disciple here. Before my mother died she had had some apprehension that "he is my eldest son but he will become a sannyasi without completing my sraddha ceremony [last rites], then who will do my sraddha ceremony?" So when she passed, I went home and completed her sraddha, and after finishing that I came, in the last part of April, to join the Math. At first, I said that my two younger brothers would finish their studies and take to their vocations, and then I would come away [from the family and join]. But Sripad Bharati Maharaj and others said that I had a great opportunity, they pressed, "No, no! Krishna has taken your wife, and Krishna has taken your mother. He has done enough for you. Really if you neglect to avail yourself of this chance, perhaps some other obstacle will come and this life will be spoiled with no hope." I asked, "What are you saying?" They said, "Come immediately." I took that advice and joined immediately. I was living together with my two brothers in a hostel, and they came with me. They went back crying, I remained in the Math. I stayed at the Calcutta Math for some time. I was requested to do some service in the press there, but I was not particularly inspired by the press work of proof-reading, etc. I had much liking for the preaching—to go on kirtan and preach. So, I was next sent on a preaching tour. The first stop was at the Dumurkonda Math [in Bengal] and from there to Benares, then to Vrindavan. There, there was nagar-kirtan for some time, then I was taken to Delhi where there was door-to-door collection for some time. Then Kuruksetra Math was established, and I was made the Math commander there, and then I was alone. A small village town and the place of Kuruksetra: that is a solitary place except for during the solar eclipse when there is a great rush of hundreds of thousands of people. Doing collection, I passed about two or three years there. Then the Delhi Math was founded and I was in charge there. Then I visited Simla and other places for preaching. Every year in August we had to come back to the Kolkata Math celebration for one month. So when I came back here I was taken by Sripad Bhakti Hriday Bon Maharaj and Sri Hayagriva Prabhu [later Sripad Bhakti Dayita Madhav Maharaj] in a party towards Madras side, installing the footprints of Mahaprabhu. Then again, upon returning, the Bagh Bazaar Math was opened, and from the original rented house in Ulta Danga the Deities were moved in a procession in a chariot to the Bagh Bazaar Math, and a one-month festival was held there. After that Prabhupad went on that year establishing and installing those Pada-pitha [footprints of Mahaprabhu] up to Mangalgiri, near Bejoyda, Kobhur, and so on. Then he went to Madras and declared the opening of the Madras Gaudiya Math and put us there. We rented a house. Sripad Bon Maharaj was the leader, and the senior sannyasi. In the meantime I was given sannyas, recommended by Sripad Bon Maharaj. He said about me, "He can preach well; he's a good preacher rather than a canvasser." I had a B.A., and I was known as Sri Ramendra Sundar Bhattacharya, B.A. My duty was to approach the people and introduce the sannyasis, and more or less I had the work of a canvasser. But Sripad Bon Maharaj said, "He's not a good canvasser but a good preacher. He can speak Hari-katha very well." Then I was given sannyas in October 1930, and after installing footprints of Mahaprabhu one by one in various places, Prabhupad opened the Math in Madras [as abovementioned], and we were left there and began preaching for three years or so. Then there was Vrindavan parikrama—circumambulation of the whole of Vrindavan. We joined that programme, and then Sripad Bon Maharaj went to England for preaching, and I was in charge of the Madras Math. The temple was constructed almost in my time. Later, the Bombay Math was opened, and I was again taken there. I lived there for some time, and later was taken with the general party with Prabhupad. Staying most of the time with Prabhupad, we preached in different places of Bengal. At 5.30 a.m. on 1st January, 1937, Prabhupad left the world. Before this, Prabhupad had wanted me to go for preaching to London, but I said, "I am not fit for this—I can't follow their accent, and I don't have the tendency to mix with them very closely. So you will spend money to send me, but I won't be able to show any satisfactory result. Of course, if you order me I must go, but I am just informing you what I am." Then he sent Sriyukta Aprakrita Prabhu [later Sripad Bhakti Saranga Goswami Maharaj] instead of me. When Prabhupad become ill, I attended his sickbed. Just one day before his departure he called for me, and he asked me to chant Sri Rupa Manjari Pada. At that time I was not accustomed to leading the kirtan. I was hesitating—Sriyukta Kunja Babu (later Sripad Bhakti Vilas Tirtha Maharaj) asked one brahmachari Prabhu, "You go on singing." Then he began singing, but Prabhupad felt dissatisfaction. He said, "I don't want to hear the tone or sweet sound. Then that brahmachari Prabhu stopped and I had to sing Sri Rupa Manjari Pada. And the others said, "Prabhupad has hereby given you admission to the Rasa-seva section." "That which is the Gracious Gift of Sri Gaurachandra, the deep, internal purport of which is known by Sri Svarup Damodar, that which is adored by Sri Sanatan Goswami, and distributed by the Rasa-tattva Acharyas headed by Sri Rupa Goswami; that which is tasted and enriched by Sri Raghunath Das Goswami and followers, and tenderly protected by Sri Jiva Goswami and his company; and that which is venerated from afar by the great personages like Mahadev, lord of the gods, and Brahma, grandfather of the world—aho! marvel of marvels, that ecstatic nectar of the exclusive service of the lotus feet of Sri Radha—you hold the perfect position to mercifully give even that to us." Before this also, I wrote an article for the spiritual newspaper Nadiya Prakash, and Prabhupad remarked to Sripad Sraman Maharaj, who was the editor, "If you can gather this type of article to publish in your paper, the standard of your paper will be raised. Such articles are desirable to be published." Anyhow, he appreciated my understanding and realization. There are many other instances. Question: I heard that Srila Prabhupad praised you as Sastra-nipuna. Srila Sridhar Maharaj: Oh. In Madras, in the Gaudiya, Gaudiya Math's leading weekly paper, there was published one siddhanta. The birthday of Srimati Visnupriya Devi and the birthday of our Guru Maharaj were mistakenly transposed. Both are panchami [fifth lunar day]. Srimati Visnupriya Devi's is on panchami of the bright moon fortnight, and Prabhupad's is on panchami of the dark moon fortnight. But they were transposed—Prabhupad to the bright fifth and Srimati Visnupriya Devi to the dark fifth. I read it carefully, and I thought the basis of the philosophising was wrong. Why has Krishna-sakti come on the bright moon, and Gaura-sakti on the dark moon? I found it should be just the opposite. I showed it to Sripad Bon Maharaj, considering it a grave error. He suddenly took up the pen and wrote a letter to the effect, "What is this? We thought that the editors have some touch with the reality and what they write has some real connection with the sentiment, but how can this sort or error be possible from them? Have they no srauta—connection? All concoction!" So it was detected, and an amendment was published in a later issue. When Prabhupad was there, the books Ray Ramananda, Relative Worlds and Brahma-samhita were published. It was mentioned that when Mahaprabhu went to Vrindavan He met Sri Rupa and Sri Sanatan Goswamis on the way. But I knew it clearly that He met them when returning from Vrindavan, so I objected. Anyway, I didn't take it to Prabhupad's notice, but it must have come to his notice that Sridhar Maharaj detected all these things. On the occasion of his Vyasa-Puja, Prabhupad delivered a written address, and there he mentioned before my name, "Sastra-nipuna Sridhar Maharaj—he has very deep knowledge of the Scriptures"; that was his consideration. Question: And discovering the place of Sri Ramananda Ray? Srila Sridhar Maharaj: Yes, when I was called from Uttar Pradesh to join the Madras party, before that my name was Sri Ramendra Sundar Bhattacharya. But now he converted my name into Sri Ramananda Das, and with this name he sent me with a group to find out the place of the conversation between Sriman Mahaprabhu and Sri Ramananda Ray, and to install the Pada-pitha there. 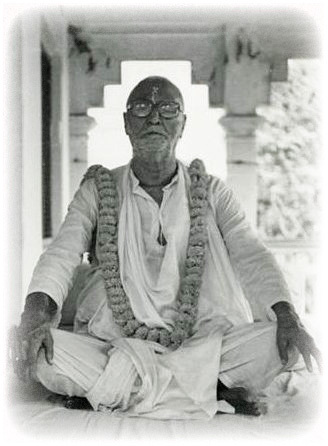 At that time I delivered a short lecture in Rajmahendry about that conversation of Sriman Mahaprabhu and Sri Ramananda Ray at Kobhur, and I heard from Sripad Krishnadas Babaji Maharaj that Sripad Bon Maharaj was of the opinion that this speech was extremely appreciable, and that it contained the most precious Teachings. Hare Krishna. Question: Does that Temple where you installed the Pada-pithis still exist today? Srila Sridhar Maharaj: Yes. During our time the Deities were installed by Prabhupad, but there was only that Pada-pith mandir. A separate mandir was established after Prabhupad, perhaps by Sripad Bhakti Vilas Tirtha Maharaj. Later, myself as a sannyasi and Sri Hayagriva Prabhu as a white-clad brahmachari, who was later Sripad Madhava Maharaj, worked together. Also, I collected funds from the Raja of Jeypore [Odisha] for the Madras Temple. There is also a story in this relation. Their new I.C.S. was Mr. O. Pulla Reddy. He was appointed 'Dewan' [government official] of Jeipur. Because that is an adivasi [indigenous peoples] area, a special sort of rule was introduced there by the British—the Dewan is more powerful than the king. We came from Madras with some recommendation from the officiating Chief Justice, Mr. Rameshan, to meet the Raja of Jeypore. Then, the Raja promised to pay the cost of the Madras Temple, but he kept requesting us, "Approach the Dewan, and he, and not I, will give you the money. So go and consult the higher. I am only giving my sign of approval, but the money will be paid by him, so meet him." I had heard that he was a half-atheistic man, so I was hesitant to approach him. I said, "No, you are the king, you are the master, so it is better that you will give the money", and so on, but he insisted again and again. "No. You will have to meet the Dewan." But when I met the Dewan, it was just the opposite. The Dewan said, "Oh, I'm the last man to pay you this amount, ten thousand, to build the temple at Madras. If you would be building it here, then I could have some consideration; people here would have some recreation in the temple. But these poor people, half-fed and half-clad—if we get any money in excess, I must give an order for their help. Funds must be used for that cause, not for this luxury of constructing a temple; and that, too, is in Madras town. Go there and collect funds to construct your temple." I said to him, "You want to help the adivasis, and I also want to help them. But your help is in a particular way, and my help is in another way. It has been told in the Scriptures that to hanker for something [in this world] is a heart-disease. It is mentioned in Bhagavatam by Sukadev Goswami, kamam hrd-rogam. "'I want this, I want that, I want thousands, I want millions—that is heart-disease, and not real. When I was a hog, I devoured a hillock of stools, but hunger is not appeased. When I was an elephant I finished a whole forest, but hunger is not finished.' So hunger can never be finished in this way. "There are so many who have amassed millions, still they say, 'No, this is very little, I want more, more.' So this is heart-disease, and in the Bhagavatam Sukadev Goswami has given the medicine for this. Vikriditam: when you can accommodate the Absolute to have His full, unrestricted play, and use His ownership with everything, every atom in the creation—if you can accommodate such a conception of the Absolute with the environment, then you can get out of this heart-disease. There's no other way.'" The man was impressed. Tears fell from his eyes. "Swamiji, I believe in God." "Your eyes bear testimony to that." "I shall pay your money. But not just now; go to Madras, I shall pay." He sent the money, and the Madras Temple was constructed. My preaching was not that of the false canvasser, but straight dealing; dealing with the plain truth. Not any coaxing or indirect way, flattering, or by sweet words to somehow rob the man. Straight talk, straight dealing representation. My guide was, 'Why have I come here?' What fascination brought me here? I tried my best to represent that fascination to them. 'This is the cause for preaching—you must appreciate such cause. I have got appreciation in this line, and I don't think that I did wrong.' Every moment I think I'm justified to accept this principle and to march on, in this line. After the disappearance of Guru Maharaj there were trustees appointed by him and he said to make a governing body... But unfortunately for us, there were many discrepancies and the mission could not be kept together. Although I thought that I must try my best to purify the movement, according to my conscience, it was not to be so. So I thought I must leave silently. My principle would not be to try to fight again amongst one another to purify the mission. That was my mentality. Others, stalwarts, could not tolerate the discrepancies and they were fighting. I was somewhat still associated when there was a case, and some stalwart Godbrothers were jailed and the case went on. I couldn't leave like a coward, but after perhaps a year the case was finished, they were released, and I went to Vrindavan leaving the association of the Math. I do not care for such fighting. They tried their best to keep me with them, but I said it was not possible for me to remain in the association of quarrelling elements. I stayed there at Govardhan for a month, and completing the Urjja vrata there, I took Govardhan Sila, came here and hired a house for two rupees per month. When I returned from Vrindavan I met my previous brother [my brother from my family], Mani Babu. He was in the service of the railway. I asked him to give me ten rupees per month for a few months. He agreed and did so for two or three months, and with that I came here. Gradually the others tried to find out where I was. Finally they found me out and they began to visit me now and then. Whenever they came they would bring some gift or so. Sriyukta Sakhi Charan Ray secured this plot [where Sri Chaitanya Saraswat Math stands today]. He purchased it with his own money. Here I began my 'heart-service' in a cottage. 1942 on Rathayatra Day I entered that cottage with Govardhan Sila. Before that I lived for some time with Sripad Kesav Maharaj in that rented house, and sometimes in Midnapore Math with high people like Sripad Jajavar Maharaj, Sripad Madhav Maharaj and others. But here I was separated. Only one person was with me, then after some time another person with a few gentlemen of Odisha came, and some other Godbrothers also came. Then Sripad Govinda Maharaj, as a boy, Sri Gaurendu Brahmachari, and others came. I do not go for preaching very often. I am almost always sitting here, and I very rarely go out in the previous style. Sripad Madhav Maharaj was always very affectionately accusing me, "You are denying the educated section of the people. Sitting here idle, you are denying the people. You have quality and capacity to preach Mahaprabhu's Teachings, especially to the educated section, but you do not do so." Whenever he came he would always charge me. Almost every year, after completing the Gaura Purnima celebrations he used to visit me, and he would charge me. And also, every year for his Kolkata Math celebration I used to go and deliver lectures there. In this way, days have passed. —Published initially in Centenary Anthology, presented here in an abridged version.